The bike was previously spotted on the roads of Pune with an ‘On Test by ARAI’ sticker on the license plate. These are the clearest pictures of the bike yet, since it first surfaced back in June this year. Although the bike in the pictures looks far from production-ready, Royal Enfield is likely to launch it soon. 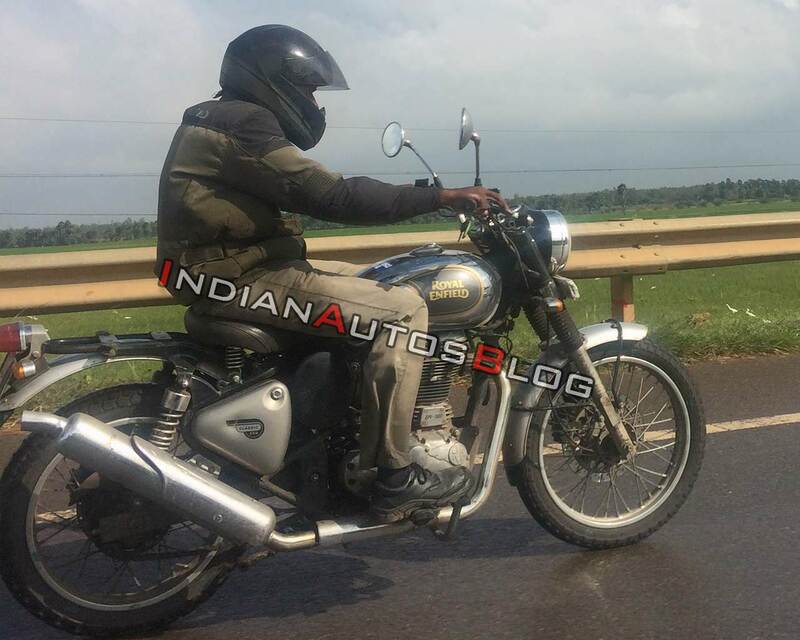 The much-hyped Royal Enfield Scrambler has been spied testing yet again. The bike was earlier caught testing on the roads of Pune. This time around, the pictures show it on test somewhere around Nelaballi in Andhra Pradesh, which is roughly 150Km from Royal Enfield’s Chennai factory. In what are its clearest pictures yet, we can see ample evidence of the bike’s scrambler characteristics. This includes a noticeably taller and wider handlebar (compared to the Classic), front fork gaiters, upswept exhaust and knobby off-road oriented tyres at both ends. And just like the test mule we had spotted on Pune roads, this prototype too doesn’t have a pillion seat. However, it also doesn’t get a luggage rack that was seen in the first pictures of the bike that surfaced in June. Instead, you see the rear subframe of the bike’s chassis jutting out akin to the 650 twins. The Scrambler in the pictures also shares quite a few components with Royal Enfield’s other models. The most obvious of these is the fuel tank and the side cowl from the Classic. The short front and rear fenders seem to be lifted straight off the 650 twins, while the front fender brace, taillight and turn indicators are reminiscent of the discontinued Royal Enfield Continental GT 535. These pictures also give a pretty good idea about the Scrambler’s riding triangle. The rider is seated relaxed and the position of the footpegs should make riding while standing up quite easy too. While it has to be said that the bike in the pictures looks far from production ready, it is likely that Royal Enfield will launch it soon. The ‘On Test by ARAI’ sticker that we saw the same bike with in Pune is strong evidence of the same. Upon launch, the Scrambler is expected to use the same engine as the Royal Enfield Classic 500. The Classic 500 uses a 499cc single-cylinder air-cooled fuel-injected engine that churns out 27.5 PS of power and 41.3Nm of torque. As for pricing, expect a slight premium over the Classic 500. Follow our updates here for more on when the Royal Enfield Classic 500-based Scrambler will be launched.